Lasco Manufacturing Limited (LASM) for the year ended March 31, 2108, Total revenue decreased by 4% from $6.95 billion in 2017 to $6.66 billion in 2018. Revenue declined 10% for the fourth quarter to a total of $1.38 billion, relative to the $1.53 billion recorded for the comparable period in 2017. Cost of sales amounted to $4.22 billion (2017: $4.39 billion) for the period, a decline of 4% year on year. For the quarter, cost of sales was recorded at $607.27 million relative to 801.66 million in 2017. As a result, gross profit of $2.44 billion was recorded for the period, 5% less than the $2.56 billion booked for the corresponding period in 2017. Gross profit for the quarter increased by 6% to $776.24 million when compared to the $733.51 million booked for the similar quarter ended 2017. LASM posted other income of $3.41 million relative to $1.66 million for the prior year. Operating expenses increased 6% to close the period at $1.58 billion versus $1.49 billion booked for the corresponding period last year. Of this, administrative and other expenses climbed 10% to $1.28 billion (2017: $1.16 billion), while selling and promotion expenses fell 9% to $300.57 million (2017: $330.42 million). Expenses for the quarter also reflected an increase of 7% to close at $611.47 million (2017: $572.80 million). Consequently, LASM recorded operating profits of $861.27 million, 19% lower than the $1.07 billion booked in 2017. Finance costs for the period fell 16% to $132.18 million compared to $157.82 million in the prior year’s comparable period. As such, profit before taxation amounted to $729.09 million, a decrease of 20% from the $910.85 million recorded for the previous corresponding period. Taxes recorded for the period amounted to $168.54 million compared to $203.59 million incurred for the corresponding period in 2017. Net profit for the year was $560.56 million, 21% lower than last year’s net profit of $707.25 million. 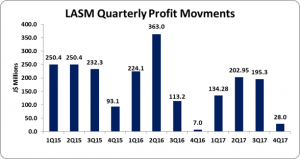 LASM booked $28.04 million in net profit for the fourth quarter, compared $7 million for the corresponding quarter in 2017. As such Total Comprehensive Income for the year ended totaled $615.95 million compared to $707.25 million in 2017, a contraction of 13%. Consequently, earnings per share (EPS) for the period amounted to $0.14 relative to $0.17 in 2017. The EPS for the quarter amounted to $0.007 relative to $0.002 reported for 2017. The number of shares used in the calculations amounted to 4,091,163,151 units. Notably, LASM’s stock price closed trading on May 30, 2018, at $4.20. Total assets increased 9% year on year, totaling $7.72 billion (2017: $7.07 billion) as at March 31, 2018. The increase in total assets over the period was mainly due to a $207.57 million increase in ‘Inventories’ to a total of $838.21 million (2017: $630.63 million) and a $361.95 million increase in ‘trade and other receivables’ to $1.87 billion (2017: $1.51 billion). Total shareholder equity amounted to $4.92 billion as at March 31, 2108 (2017: $4.44 billion). Consequently, book value per share amounted to $1.20 relative to $1.09 in 2017.